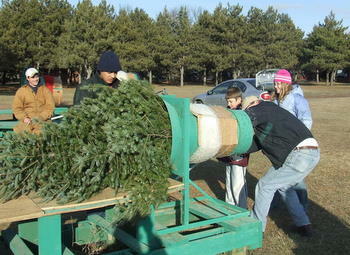 H & Z Tree Farm -- Welcome! Welcome to H & Z Tree Farm! All sizes - from 5 to 20 feet! Frasier Fir up to 20 feet! All trees are the same price! 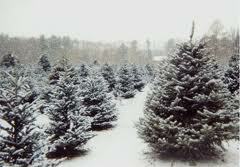 We have both sheared and unsheared Christmas trees! We even have all natural Christmas trees! 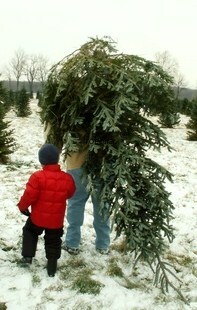 Even if you want a 8 foot tree, you can cut down a 12 foot tree and keep the boughs for arts and crafts projects! Bring the entire family and create lasting memories! 1. Drive to H & Z Tree Farm. 2. Pull up to the gate. 3. You will be greeted with a saw and candy canes. 4. The greeter will explain the layout of the farm. 5. You will drive out to the fields of trees. 6. 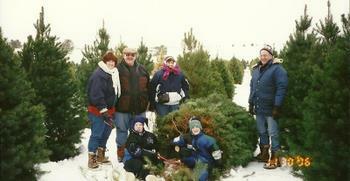 Hunt for your Christmas tree. 7. Cut your Christmas tree down. 8. Place your tree on top of your car. 9. Drive back up to the entrance. 10. H & Z staff will remove your tree from your vehicle, shake the tree to remove loose needles, bail the tree in netting, and then tie the tree down to the top of your vehicle. Includes Shaking, Netting, and Tying Down!